Prairie Organic Grain Initiative is pleased to offer Prairie Organic Farmers an exclusive discount on Farm Credit Canada’s Field Management Software. 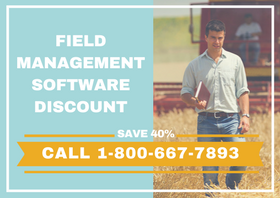 Farmers receive a 40% discount off the Field Management PRO and PRO 360 programs. Field Manager PRO is a management software designed to simplify managing your farm data, keeping your crop and field management information in one place – helping you make better business decisions. Field Manager PRO 360 helps you see your farm like never before by revolutionizing how you manage your farm data. Get the crop and field management you expect from Field Manager PRO, plus map and compare operations, all tied into your Geographic Information System (GIS). Prairie Organic Farmers will receive additional benefits including 3 webinar training sessions from an FCC Management Software Specialist or accredited Field Manager Consultant, monthly online webinar training for additional users, and one year of unlimited support and product updates through the FCC Management Software Customer Care Centre. For more information on FCC Management Software, click here.